Poe Ballantine. Vanessa Veselka. Zadie Smith. John Jeremiah Sullivan. Alice Munro. 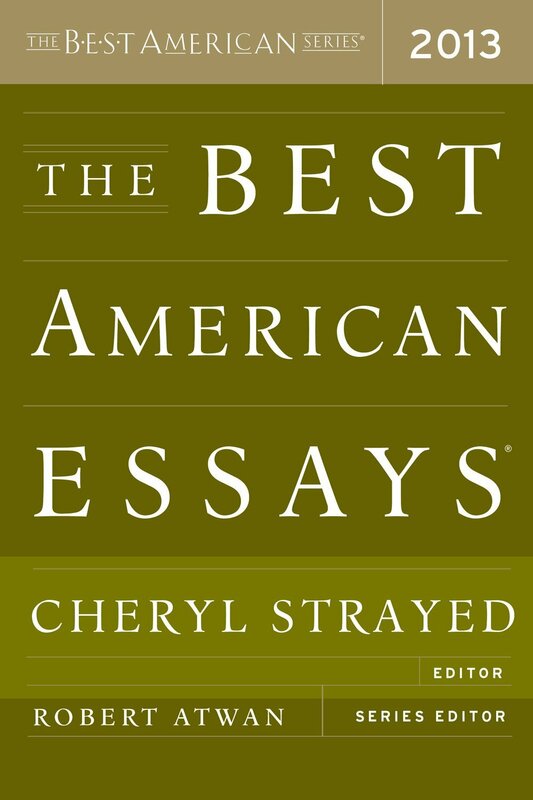 An essay collection that includes these writers – edited by Cheryl Strayed, no less – almost promises to be nothing less than stellar. And The Best American Essays 2013 delivers. As in every anthology, some essays warranted more than one read, while others were skipped, and then read when the rest of the book was finished. But as a whole, this collection is sharp, compelling, and diverse. I’d like to think this is due to the original sources of these essays. While there are the usual Manhattan MFA-friendly suspects like The New Yorker and The Paris Review; ZYZZYVA, Ploughshares, Hotel Amerika, Prairie Schooner and The Sun were also in the mix. One of my favorite selections was Kevin Sampsell’s essay “I’m Jumping off the Bridge,” which takes the reader into an ordinary workday-turned-emergency when a suicidal customer walks into the bookstore. It was a gentle reminder of the silent stories everyone carries around with them, and the connections we can make. The suicidal man shows Sampsell a picture of his daughter before he is taken to the hospital. Months later, mired in his own blackness and suicidal fog, Sampsell reaches out to his son and decides to live. Connection. A few essays later, Marcia Aldrich describes labor and delivery in exquisite prose in “The Art of Being Born.” The violence and trauma of something so necessary for life, that is so often described in terms of beauty. Here, the beauty and blood coexist, along with the pain and pleasure, the ambivalence and admiration. In Michelle Mirsky’s “Epilogue: Deadkidistan,” we get another view of the bond between parent and child, but one that has been ended prematurely. The matter-of-fact, stark reality of children dying, in a world in which death is still one of the last, if not the last, taboo, is laid out next to the author’s life. She struggles to explain life after loss. Birth and death weave throughout the book, creating a tapestry that links the essays together and makes the collection feel cohesive and complete. Especially arresting is Veselka’s “Highway of Lost Girls.” In this personal essay, she takes the reader on her journey as a teenage runaway, where she may have met a notorious serial killer of young women. Decades later, she explores memory and fact to see which, if any, prove to be true. This was the fourth essay listed, but the first one I read, having read her novel Zazen. When I finished, I had to put the book down. It is almost unfair to put this essay alongside any others; her prose is electric and the story completely compelling. Alice Munro’s “Night” was so familiar to me, until I realized I had originally read it in the “Medicine” issue of Granta. I happily read it again, and I actually think I prefer her nonfiction to her short stories. Walter Kirn’s tale of losing and finding and creating faith is detailed in “Confessions of an Ex-Mormon,” and in Megan Stielstra’s “Channel B,” an overwhelmed and lonely new mother finds comfort and companionship through a baby monitor. The theme of companionship is taken to an extreme in Mako Yoshikawa’s essay “My Father’s Women,” an exploration of the relationships of the author’s late father. Throughout each story is the need to be loved, the need for someone else to understand us – anyone, even for a moment. Sometimes you find it. Sometimes you don’t. “…The essay’s engine is curiosity; its territory is the open road….their relentlessly searching quality is simultaneously like a punch in the nose and a kiss on the lips. A pow and a wow. An ouch and a yes. A stop and a go….” Strayed’s description of the collection, from the introduction, captures the kaleidoscope of writing in this year’s edition. I think the stories are best read out of order; read them in the order to which you feel drawn – the beauty of this particular collection is the fluidity of the pieces, and they will likely be read more than once, anyway. This series consistently showcases what an exceptional essay should be, and the 2013 collection does not disappoint.